A group of us from the house drove to Ma’ale Adumim to participate in Dr. Rivkah Lambert Adler’s inaugural Torah School for the Nations. We were welcomed warmly by a predominantly English speaking synagogue that seemed very excited to host us. The room was abuzz as roughly 45 Torah keeping non-Jews of various stripes (mostly Hebrew roots, though I believe a couple gerim and Noahides) came in and immediately began conversing excitedly. Friendships were renewed by many who were coming from different parts of the planet. Most exciting was to see old friends and make new friends among the sizeable contingent residing in Jordan. Other nations represented included Switzerland, Germany, Holland, Canada and the US. 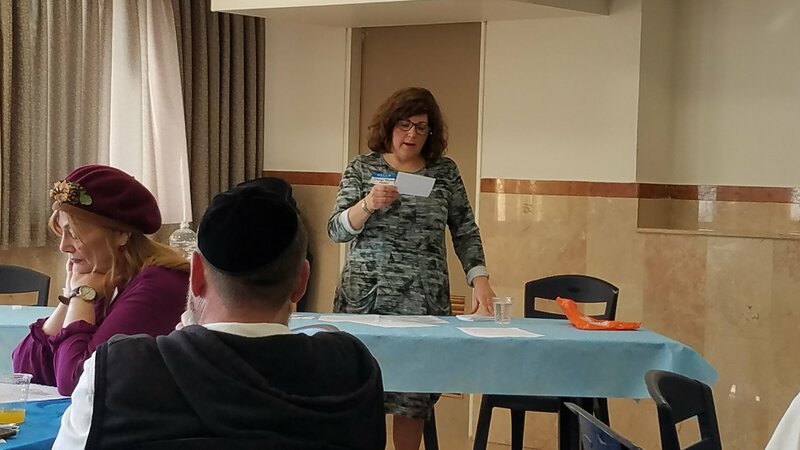 Rivkah began with a short welcome before her husband, Rabbi Elan Adler presented a talk about the parts of the Oral Law and how Judaism sees it. Rav Elan was particularly funny in his delivery, a gift when interacting with a crowd. He described the basics of the Mishnah, the recorded Oral Law, as well as introduced us to the body of work called the Gemara or Talmud. Talmud is basically the commentary on the Mishnah, available in two forms, the larger Babylonian and the Jerusalem. 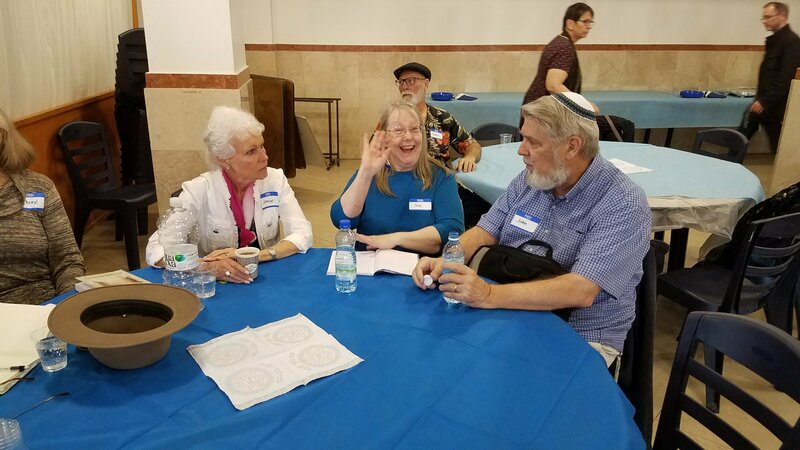 After Elan, Dr. Rivkah Adler shared a bit of her story as she explained her new ‘nation goggles.’ Basically, about 18 months ago she began rereading the Torah and the Tanakh with the eyes of one who began to see ‘peoples’ and ‘nations’ everywhere. It was fun to hear this aspect of her story as each of us has had paradigm shifts when the Father began to open our eyes to Torah in the Scriptures. It is a strange thing when we suddenly begin to ‘see’ something that was there all along, but not visible to us. After a filling “kosher for Passover” lunch, we continued with Gidon Ariel of Root Source, a Torah teaching resource, talking about the Jewish Perspective on the Messianic Times. He presented a number of resources within Judaism and their respective relevance to the Messianic expectations of Jews. As I understood it, while most Jews are not actively discussing the Messianic prophecies, they are all living with the expectation of a coming Messianic age. His own barely contained excitement demonstrated that he indeed hears the approaching footsteps with great anticipation. My favorite nugget from Gidon was his use of the word ‘orthoprax’ rather than ‘orthodox’ in reference to the outward doing of the commandments rather than a simple intellectual assent. I would that Christendom would understand and embrace the significance of Orthoprax over Orthodox. Our last speaker was Chaya Bluma Hadar who taught on the first twelve letters of the Alefbet and used a traditional song to do it. In rapid fire fashion, she gave numerous insights about each of the letters presented. After a quick wrap-up and closing comments, Rivkah mentioned something of the beauty of fellowshiping in unity. Jossy of Switzerland immediately began singing what we were all thinking! Hine Ma Tov!! We sang both traditional tunes an then the room exploded in hugs, good-byes and final greetings as we all prepared to head out. Keep an eye on Rivkah’s site as she will be having upcoming events for Torah School for the Nations as well as updates on her book and speaking engagements. This entry was posted in B'Ney Yosef Congress and tagged Dr. Rivkah Adler, gerim, Gidon Ariel, Hebrew Roots, Ma'ale Adumim, Torah School for the Nations. Bookmark the permalink. A wonderful day with wonderful people! 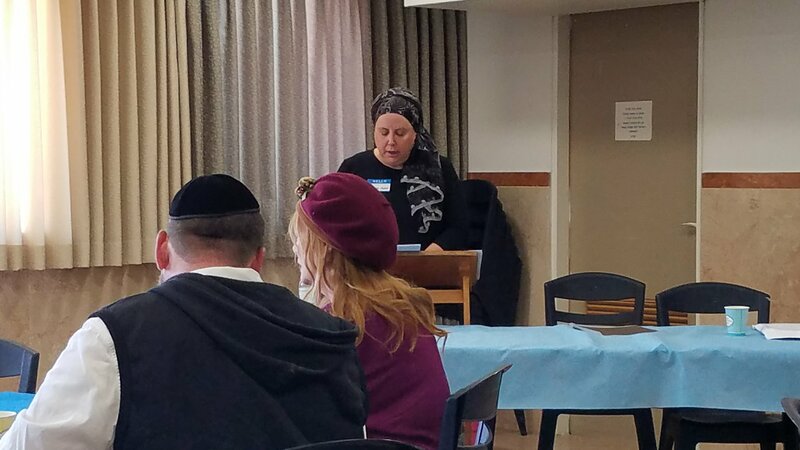 Rivkah’s sharing of her new realization that God intends EVERYONE to love and serve Him (not just the Jews), was especially sweet – reminded me so much of our excitement when He opened up the verses that revealed His Torah being for EVERYONE, not just the Jews! Abba is moving on ‘both sides of the aisle’, and it is such a thrill to be a part of that! Thanks for the wonderful pictures – John forgot to take any. It was such a joy to get to see you and Kelly and the boys again – we’ll be looking forward to more visits. Come and see us in Jordan – we all have guest rooms here!